The Smart Door Lock puts you fully in control and gives you the freedom to secure your home without the need for a key. The ConexisTM L1 allows you to configure, control and unlock your door, all from your smartphone via a secure Bluetooth low energy App. Your smartphone becomes your key. Furthermore you can create and send mobile keys to family and friends as and when they require them. For ultimate peace of mind, you can keep track of who comes and goes from your home by simply using your phone by receiving a notification when a mobile key is used. 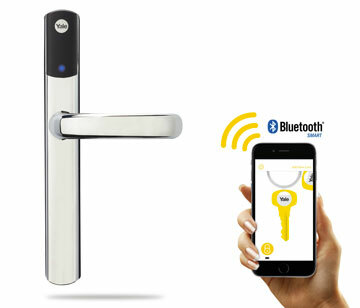 Twist & Go – The secure bluetooth Yale Lock App on your smartphone enables you to configure, control and unlock your Smart Door Lock. Simply touch the lock to wake up the bluetooth function and twist your phone 90 degrees to open the lock. Your smartphone is now your key – no need to worry about misplaced keys. Say goodbye to extra keys – Mobile keys can be sent via the App to family and friends to allow them access when required. Choose to give access for a few weeks, or just a few hours. Know who comes and goes – Have peace of mind knowing your loved ones are home safely by receiving a notification when mobile keys are used. Enhanced Security – A tamper alarm deters potential intruders. A secure push and turn thumb turn provides additional security to your door, protecting against letterplate fishing and inquisitive children. Battery Powered – No wires and easy to replace. Guarantee – 2 Year guarantee and UK consumer support with each Smart Lock.